Most discussion of voter behaviour focuses on wealthier voters, mortgage belt voters in big cities or people whose vote is influenced by hot issues such as coal seam gas, coal or the tollroad Westconnex. Yesterday, I had a short conversation with a resident in a rural town on NSW's Mid North Coast in the electorate of Oxley. It provided a different insight. I'm in a large supermarket in one of the towns on coastal NSW. It's mid morning on Saturday and the store is crowded with shoppers buying their food for the Easter weekend. As I wait in line, the check out assistant chats to a truck driver just ahead of me. The driver explains that he's stopped to grab his food for the week before he completes a long day's work that will end back in a nearby town further inland. The thirty or so year old assistant mentions that he is suffering from continual severe muscular pain in his neck. Watching him move his head back and forth at an angle while he works under pressure to move through the queue, I'm not surprised. I've removed the names of towns and supermarkets to prevent any identification of the assistant. WB : Have you considered seeing a physiotherapist - it might be a repetitive strain injury? Supermarket worker in a resigned tone: Just two more businesses closed down. WB: That's no good. No offence to you, but I guess big supermarket chains don't help. Supermarket Worker: No, it wasn't food, it was building and clothes. WB: The Nationals in the NSW government were part of that. Yet they got re-elected up here. Supermarket Worker: I don't vote. It makes no difference. They're both the same. 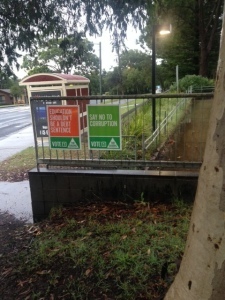 Supermarket worker: I did consider voting Green this time. WB: Maybe you should consider that next time. I know of the woman who stood for the Greens - she stood up for the refuge. She was very good on that issue. Supermarket worker: Politicians, there're all the same. As the old saying goes, two things run the world: money and politics, and one runs the other. During this brief chat, the checkout worker had been very rapidly processing my shopping. He moves on to the next customer, a woman who'd just "knocked off" work, assisting an older man, who was having a lot of difficulty walking, to do his shopping. Oxley, the electorate where this resident lives, includes the coast fringe and rural valleys between Coffs Harbour in the north to Port Macquarie in the south. 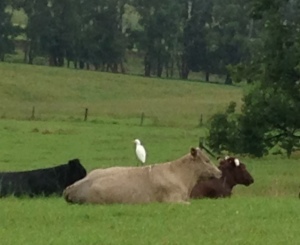 The towns of Urunga, Bellingen, Kempsey, Wauchope and South West Rocks are all within its boundaries. Much of the electorate, including the beautiful Macleay Valley, is on the land of the Darghutti people. The electorate has always been held by the Country and then National Party, except for a short period when the sitting member defected to the Liberals. In 2011, the National Party gained a strong swing towards it as part of the overall swing against the Labor government . 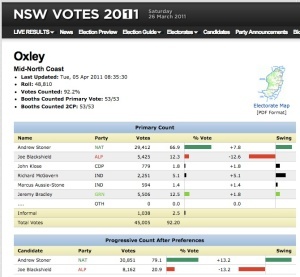 Up until the 2015 election, the people of Oxley were represented by the Deputy Premier Andrew Stoner, who resigned last year. Melissa Pavey who was already a National Party Legislative Council member was preselected for the lower house seat. So although she was succeeding a high profile member, Pavey had the advantage of being an experienced sitting politician. While she won 52% of the primary vote, Pavey suffered a massive swing of more than 18% of the two-party-preferred vote against her. She lost more than the Nationals gained in 2011. Most of this swing went to the Labor Party candidate Fran Armitage who lives on a dairy farm and is a full time carer. She won 26% of the primary vote, winning back the swing against Labor in 2011. Carol Vernon for the Greens, has had a 40 year career in the public education sector. She won just over 15% of the primary vote. She increased the Greens vote by 2.7% but came third in the primary vote. 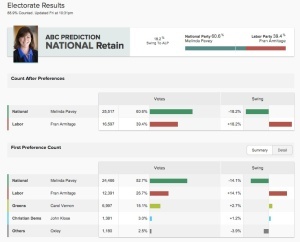 While Oxley is still a safe Nationals seat, if a further one in ten voters were to swing away from the National Party, Pavey could be in trouble at a future election. As rural towns struggle economically and older voters become more dependent on public services, the National Party could be vulnerable to either Labor or the Greens, especially if there are further cuts to services. There may also be growing support for action around environmental issues and climate change that could benefit the Greens. Do you know more about the electorate of Oxley or issues for residents on the Mid North Coast of NSW? If so, I would welcome your comments.